House of Flying Daggers director Yimou Zhang new film The Great Wall is a spectacular behemoth of a film. A fantasy which centres around one of the many mythical stories surrounding the mystery of great wall of China. The film is to this date, the biggest ever co-production between China and Hollywood and features some of the most accomplished actors and martial-arts experts in the business. It is also Yimou Zhang’s first English speaking production. The Great Wall stars Matt Damon as William, an English speaking mercenary soldier, travelling in a mystical land with a his companion Tovar (Pedro Pascal) in search of an elusive black powder which could win wars and defeat mortal enemies. When they suddenly run into a huge army defending a wall from monstrous pre-historic like creatures, the pair reluctantly join the army and offer to help defeat the creatures. 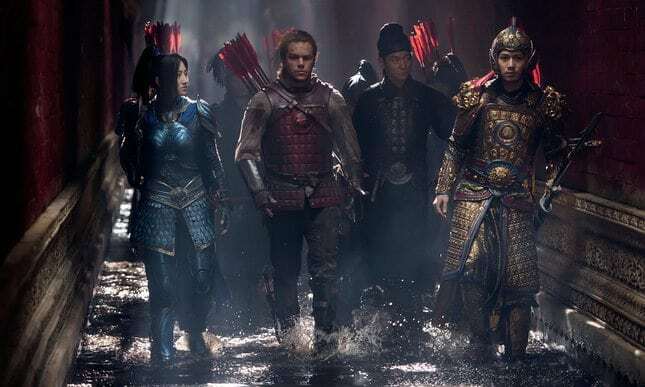 Beyond the truly impressive CGI elements of the film and some of the most elaborate choreographies, it is hard to see The Great Wall as being anything but enjoyable silly nonsense. What is even more astounding is the presence of Matt Damon in a film like this. Damon, an accomplished indie as well as action star, is of course brilliant in every scene, however one cannot help but see through the reasoning behind having any English speaking actors at all in this production. Also starring along Damon, is the brilliant Tian Jing in the role of Commander Lin Mae, a respected female soldier with a badass attitude who also happens to be William’s love interest. On the Whole, The Great Wall makes for an enjoyable action filled 1hr and 45mins, with a couple of less exciting expositional bits thrown in for good measure. If you are expecting anything beyond great CGI monsters and elaborate martial arts choreographed sequences, this isn’t for you. Otherwise, it is a fun-filled production which will keep you entertained till the end. The Great Wall is out on Friday 17th February.